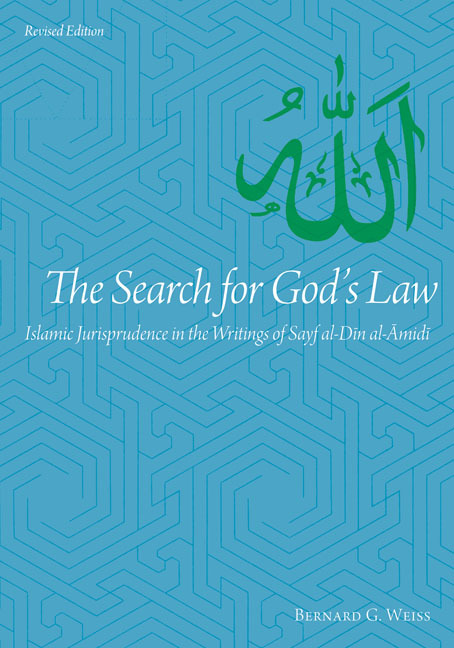 Scholars praised the 1992 edition of The Search for God’s Law as a groundbreaking intellectual treatment of Islamic jurisprudence. Bernard Weiss’s revised edition brings to life Sayf al-Din al Amidi’s classic exposition of the methodologies through which Muslim scholars have constructed their understandings of the divine law. Weiss’s new introduction provides an overview of Amidi’s jurisprudence that facilitates deeper comprehension of the challenging dialectic of the text. This edition includes an in-depth analysis of the nature of language and the ways in which it mediates the law, while shaping it at the same time. An updated index has been added. Bernard G. Weiss is professor of languages and literature at the University of Utah. He is the author of The Spirit of Islamic Law and co-editor of the Brill series Studies in Islamic Law and Society. "The Search for God’s Law is all that one might hope for in its depth, its subtlety, and its comprehensive vision."